Home Companies Xiamen Brightworld Furnisings Co.,Ltd. Assembling package . The cabinet price is the same if you choose different packaging . 2. Door material: 18mm Vinyl Wrap face MDF E1 (PVC ,Thermo foil),High Moisture ResistantMDF. 3. Carcass material:16mm E1 Moisture resistant chipboard /Particle board /Meliamen face. 4. Cabinet making: Frameless making.European morden style. Your designs are also welcome ,please contact us we can meet any reqiremwnts of you. With our well-managed production facilities and experienced marketing team, we’re committed to providing quality goods at competitive prices, punctual delivery, and outstanding customer service. Please send email or call us for a quote on your next buying needs. We look forward to developing a long-term business relationship with you. Factory visits are welcome. We offered OEM service. Brightworld is the professional manufacturer of high quality kitchen cabinet, bathroom vanity, wardrobe etc, which integrate with technology research and development and business trade .Our products export to Europe, America, Canada, Australia, the Middle East, and Southeast Asia etc. Door options including solid wood, lacquer, thermo foil (PVC), melamine, laminated and so on. 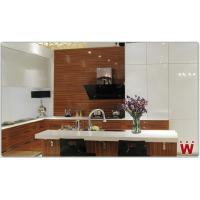 1) 18mm thickness MDF board with lacquer surface ( High gloss / matt finishing ) ---- lacquer door panel . 2) 18 mm thickness E1 standard particle board with melamine surface ( different colors and patterns ) --- melamine door . 3) 18mm thickness MDF board with PVC film . --- PVC door . 4) 18mm Solid wood door . 1) BLUM brand hinges and drawers with soft closing . 2) Artificial quartz -- High end chinese brand . 3) Cheap chiense brand artficial stone . We will provide you competitive price ,best service and high quality products,please contact us for more detail.